Last of the September one pot recipes is cooked together on one tray in the oven for 30 minutes. Chicken can be bland and needs to be infused with a bit of flavour and here a simple sprig of thyme, a clove of garlic and a knob of butter produce a succulent chicken breast. Peel and slice each garlic clove in two. Cut a pocket into the side of each chicken breast and insert a sprig of thyme, two halved pieces of garlic and a knob of butter. Drizzle a little olive oil on a baking tray and place the chicken on the tray, turning once to lightly oil. Wash the sweet potatoes, keep their skins on and dry with paper towel. Cut each sweet potato in half (skin on) and slice each half into 4 wedges. Place these around the chicken on the tray and drizzle with olive oil and sprinkle over with paprika. 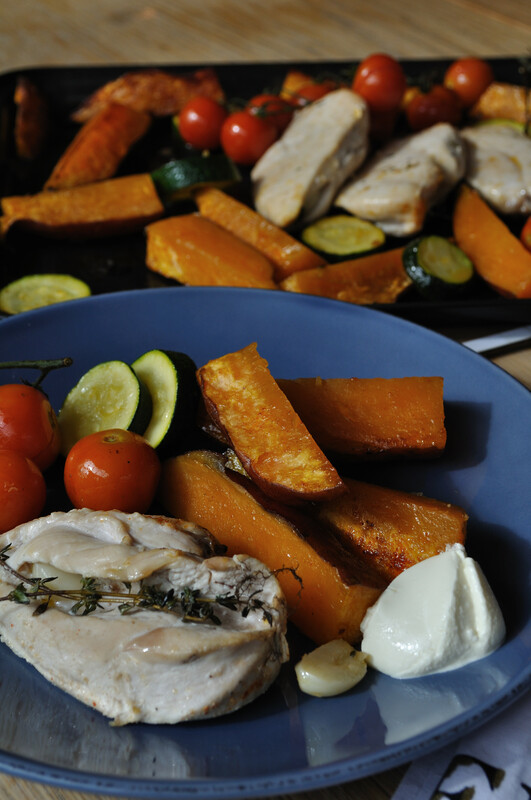 Cook the chicken and the sweet potatoes for 20 minutes. Slice the courgette into 8 thick slices and add to the tray with the cherry tomatoes. Turn the chicken over. Cook everything for 10 minutes more. Serve with a dollop of sour cream. Enjoy. What a delicious idea! I love roasted veggies, so this is perfect! Another winner down under! So easy, tasty and nutritious. We’ve got some leftovers to polish off tonight and then we’re going to attempt your pizza recipe during the week.